I FIND MYSELF struggling with two powerful emotions. On one hand, the recounting of the long history of Hawaiians marginalized in their own land triggers a feeling of kaumaha, a sense of heaviness and grief. "Broken Trust: Greed, Mismanagement & Political Manipulation at America's Largest Charitable Trust" by Judge Samuel King and law professor Randall Roth. University of Hawaii Press (uhpress.hawaii.edu). Sunday: Trustees of Bishop Estate held power without accountability, a recipe for disaster. Monday: The selection of Bishop Estate trustees by Supreme Court justices showed signs of manipulation. Tuesday: Kamehameha Schools alumni, staff and students rose up against trustee Lokelani Lindsey. Wednesday: Investigating Bishop Estate was like probing the CIA, said a court-appointed master. Thursday: Attorney General Margery Bronster went head to head with Supreme Court justices over trustee selection. Friday: Instead of housecleaning, the interim trustees of Bishop Estate "handed the keys to the old guard." Want to comment on excerpts? Letters received by tomorrow evening will be published in Sunday's Insight section. For instructions, see "How to write us" on the letters page. 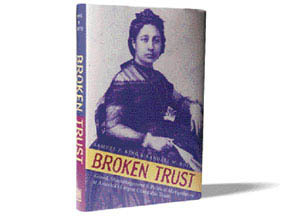 This link takes you to the original "Broken Trust" essay of Aug. 9, 1997, and other Star-Bulletin stories about Kamehameha Schools. Kaumaha is what happens when a people are stripped of the social, cultural and ethical anchors that have given them worth and stability. King and Roth paint a vivid and compelling picture of how Hawaiians at the Kamehameha Schools were systematically disconnected from the rich culture of the Hawaiian people by a school and a society that held them in no esteem. The goal of being "good and industrious men and women" that Princess Pauahi set for her people was translated by the haole leadership of Kamehameha into the goal of producing compliant and submissive laborers for the powers then controlling the fate of these islands. This account of the recent battle to bring pono to the legacy of Princess Bernice Pauahi Bishop also stirs within me powerful feelings of pride and hope. It is a story of great courage, vision and perseverance in the face of overwhelming odds. Despite enormous political and economic power on the part of Bishop Estate trustees and their political supporters in 1997, Hawaiian men and women and others from our community made the decision to stand and proclaim, "Enough!" People without much money or power decided that the abuses of authority at the Bishop Estate and Kamehameha Schools were so egregious, so contrary to Hawaiian values, and so destructive to the ideals of Princess Bernice Pauahi Bishop and the children her legacy served that they chose to leave the comfort of their routines, put on their sneakers, and march and speak out for what is right. One of the early T-shirts of Na Pua a Ke Alii Pauahi had a simple message that said it all: "Do The Right Thing." THE CONFLICTS of Bishop Estate and Kamehameha Schools chronicled here have led to a dawn of hope and a strengthening sense of self-worth in more and more Hawaiians. There is a growing recognition that Hawaiians as a people must set goals for our community that transcend individual and small-group interests; and there is a growing belief that one day the kaumaha of more than a century will lift. In traditional Hawaiian culture, the relationship of the alii with the commoners was that of an unstated compact of common benefit. The chiefs enjoyed power because they committed themselves to caring for the larger community in a form of servant leadership. Part of the outrage in the Hawaiian community in the Bishop Estate battle was the violation of this relationship by Bishop Estate trustees, the alii of contemporary Hawaii. All of Hawaii has learned from this remarkable series of events that the Hawaiian people, like their forefathers, are prepared to hold their leaders to this traditional standard. It is a wonderful source of encouragement, hope, and pride for all Hawaiians, and it is a responsibility we need to keep before us as a community. Pauahi deeply loved her people and desired to nurture, educate, and enable them through her legacy. Hawaiians are beginning to understand how great a privilege, and how awesome a responsibility, this represents to each of us. This is not merely a story for Hawaiians or for people living in Hawaii; it is a human story. It demands from all of us a commitment to engage in the issues of our community, to be vigilant against the abuse of power and to be willing to stand for what is pono, what is right, despite intimidation and threats. And to act wisely, we must stay informed. We may not always agree, but we need to keep talking -- to discuss and debate the issues and insights it provides for our lives. E ola mau ka makana a Pauahi! Long live Pauahi's legacy! This week the Honolulu Star-Bulletin is excerpting chapters of a new book about the Kamehameha Schools/Bishop Estate scandal that erupted in 1997 and forced the removal of trustees and changes in the estate's management. "Broken Trust: Greed, Mismanagement & Political Manipulation at America's Largest Charitable Trust" was written by two people at the heart of the event, Judge Samuel King and law professor Randall Roth. The book was published by the University of Hawaii Press (uhpress.hawaii.edu).